Hester Pryne is accused of infidelity, which was considered an egregious sin among puritans who lived in New England in the late 19th century. Hester’s sin is just short of murder, or selling one’s soul to the evil and turning into a witch. She is sentenced to prison for a short-time, where she gives birth to her daughter - the baby crowns the glaring symbol of her misstep. The town and the chief priest decide to painfully reinforce the consequences of her sin to the public, to teach a lesson on morality. She is made to take a public stand with her baby and is condemned to wear the scarlet letter “A” on her chest for the rest of her life, to bear a constant symbol of reminder of her shame, her sin and her punishment. Despite her humiliation and cruel social-isolation and repugnance, Hester doesn’t reveal the name of the man who sinned with her, nor do the people of the town know who her husband is. 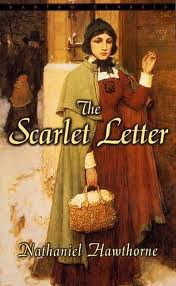 As Hester bravely lives her life, trying to put away her sorrow and hurt, the men torment themselves - the husband hungry for revenge and the lover suffering with guilt. Hawthorne’s story discusses the prejudiced definition of “sin”, the different depths of morality, and the power of human conscience, while sensitively bringing out one woman’s resilience and agony. This story and its themes are quite Crime and Punishment-esque, especially in the context of the slow and torturous ways in which the lover gets haunted and plagued with guilt. By following the lives of the condemned and the aggrieved, books such as these, offer a detailed and honest discussion of whether the original act can really be called a sin. And if the act were really a mistake, is the punishment justified in its severity? Is one single act enough to nullify all the other thousands of virtuous deeds and a righteous life led? In cases of infidelity, the lines are not quite clear as to who the victim and sinner are, and it was especially true in a cloistered era when individual feelings were brushed aside to doggedly conform to standards of societal-acceptance. All of these questions coalesce to get to the roots of the definition of morality itself. Such stories also bring to light the dangers of a blind-folded view towards morality, right and wrong. Devoid of empathy, understanding and a basic touch of humanity, any framework of religion or morality is meaningless to the humankind. They don’t achieve their purpose of reformation - they only deepen the scars and extinguish the human spirit. Open-mindedness, rational thought and humane feelings need to be used as combined tools to assess a situation and think about reformation. In most cases, the “sinner” is usually the one with an unsoiled spirit and mind, and it’s the other officious judges of sins who lack integrity and purity of spirit. Such books discuss my favorite themes on morality and I find that my views remain the same no matter how many different authors explore the topic. This book definitely deserves its stature as a literary classic.